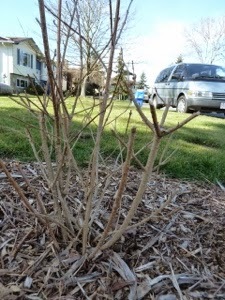 My Home and Garden: What the heck happened to my forsythia? I went to check on the yard when I returned from Hawaii. It is so warm on Vancouver Island it was a smooth transition temperature wise. I stopped to look at my forsythia bush which looked odd. 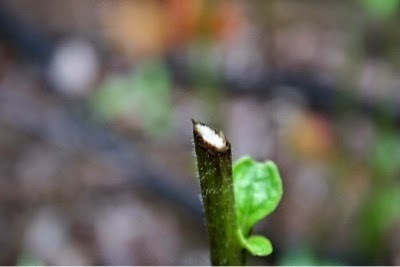 As you can see the outer branches were cleanly cut on an angle with, I assumed, sharp pruners. The branches were left on the ground. I took them in and put them in water to flower inside. I was completely confused why anyone would want to hack all but four branches off my forsythia and then leave the prunings behind. Was it malicious? I was showing Amanda the damage. Just like me she was confused as to why!! We strolled a bit and I noticed the lower branch on my fig was cut the same way. The branch wasn't visible from the street. Okay....what!? Then the light went on. Amanda had been telling me that while we were gone she and Noel saw two rabbits in our yard. We have not had rabbits in the 36 years we've lived here. So I didn't recognize the damage. 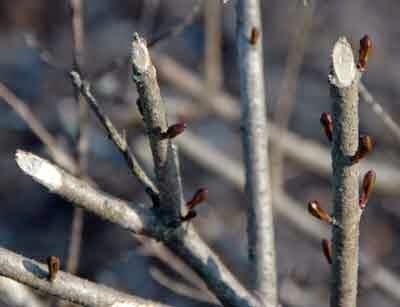 Here are some Google images of rabbit 'prunings'. Doesn't it look like a nice pair of Felco Pruners did this. Mystery solved. So rabbits eat Forsythia then? I wouldn't have thought that. They left all of the branches neatly severed but not eaten. Allan is thinking that maybe they slice off little branches to sharpen their front teeth? Makes sense to me. Bunny berries on the ground would seal the case against the rabbits.